NOW THREE LEVELS OF PRODUCTION STARTING AT ONLY $49 ! In a very short time your Callers On-Hold will have little reason to give up and then ultimately hang up. "Keep 'em on the line" is what it's all about! With over three decades of "Caller On Hold" profile research we know what it takes to Keep Them On The Line! Entertain & Inform your callers as a courtesy, but better yet, use this valuable time as a marketing tool to enhance your business sales, advertise, and heighten your caller's knowledge about your company or organization. Either way, make sure they are there for you when you return to the line... 30 seconds later or 3 minutes later. Be sure to keep Holiday Messages with seasonal information updated year round! 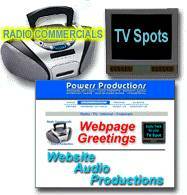 Let Powers Productions produce your Voice Auto Attendant Prompts and Mailbox Greetings too! YES - WE CAN RECORD AUDIO CASSETTES, CD'S and more Formats! YES - WE CAN RECORD FOR TALKSWITCH! No Lease, Contracts or Commitment ! These are the greetings with navagation options you hear when calling many companies. Example, "Thank you for calling Powers Productions, Audio Production Masters. To talk with any of our creative staff Press One, for Accounting Press Two..." Beyond that we can also record any mailbox greeting... "You have reached the desk of Gregg Powers.." We also can supply you with IVR (Interractive Voice Response) recordings. We can encode in a number of formats for just about every system - even email you the audio or in some cases upload your prompts. We also sell many of the Attendant and Digital Announcers that might be required for this feature. Contact us for pricing and details! Looking for a professionally produced Radio Commercial? Have you found the perfect Video Production company for your TV Spot but you need an awesome Audio Track including Voice / Music / Sound Effects to accompany it? Does your Website need an "Audio Boost" to keep your visitors coming back and staying longer? Call Powers Productions at 702.868.7676 or Email us. We create all kinds of Audio for whatever you need. If you're looking for "dry voice," background music, sound effects or a fully produced / mixed / mastered project, our team can help you! Find out more about our audio productions NOW! We'll fully produce audio tracks for your Corporate Video, Instructional & Training pieces and more! If your upcoming project includes a Corporate, Instructional or Training Video, Trade Show or Exposition (Expo) presentation Powers Productions can help you out. With affordable rates and professional quality your projects and presentations will stand out. Find out more now! As we continue to build our on-line telephony equipment pages not all products will be shown. We do sell a complete line of digital record/playback equipment from OnHoldPlus (OHP-6000, 6500, 7000, 7500 and MOH-500e), Premier Technologies ADL-3100 & HiFi series as well as their entire line, Bogen ProHold (Pro4, Pro8, Pro12), Viking Electronics Digital Voice Announcers (DVAs) as well as their entire line of interfaces, Skutch Electronics - On-Hold interfaces as well as the complete product line of Nel-Tech equipment. If you don't see a product on-line just contact us. We have access to just about any telephony equipment you need. Please contact us for current pricing (702.868.7676). We also stock Pre-Owned equipment that we certify in our own lab, then we include our Powers Productions Repair/Replace warranty at no additional charge. This is a great way to save a lot of money when purchasing equipment. Contact us for current stock as it may change daily. SANITY FACTOR: IS YOUR CURRENT ON-HOLD MUSIC LEGAL? Are you playing the local radio station to your clients holding? Does your office subscribe to the latest Satellite Radio (XM/Sirius), or are you playing your favorite collection of CD's you have personally invested in to your On-Hold audience? Maybe you've piped the music channel from a local cable company into your Message On Hold input... Unless you are paying a separate "Public Performance" yearly license fee you may be breaking U.S./Federal Copyright laws. Getting caught alone can cost you many many times the cost of a Powers Productions Message On Hold production! Failure to obtain a license to perform publicly copyrighted music is copyright infringement under the copyright law. The copyright infringer is subject to a civil suit in federal court. Sanctions against an infringer can include an injunction and the copyright owner’s actual damages, as well as the infringer’s profits, or statutory damages of up to $30,000 for each copyrighted song performed without a license. Read more about the legality of your On-Hold music... and RELAX! When you purchase a Powers Productions Message On Hold audio production, your license performance fees are completely and legally covered. We're happy to accept any major credit card for payment ! Powers Productions is PayPal Verified! with any major credit card or e-check through PayPal! "Below the line" FYI: Check out all of these services provided by Powers Productions: Message On Hold and On Hold Messages, Music On Hold, Callers On Hold and On Hold Music... Holiday and Christmas Recordings, Telephone Ads On Hold, Promotions On Hold, Commercials On Hold, Call Waiting, Music and Message for Telephone Systems, Voice Prompts, Interactive Voice Response ( IVR ), Mailbox Greetings, and Auto Attendant prompts. We also record Company Business Greetings, Company Information, Automatic and Auto Answer recordings, Corporate Telephone Greetings and Corporate Training Video tracks, Complete Audio Productions, Radio Commercials and Spots, TV commericals audio production, Audio tracks for corporate video, Macromedia Flash Presentation Audio, Audio for Instructional Videos, Audio for Training Videos, Films, Audio Books, Commercial Production, In-flight entertainment and Industrial Narration, Website Narration, Voice Overs, Audio for Webpages and Websites, Computer software programs and tutorials. Show coming up? We produce Trade Show Presentations, Expo Presentations, Exposition Presentations and Services, Infomercials and More! We'll record messages for telephone autodialer units and callout marketing. We are also your link to telephone systems and hardware like music on hold players, message on hold players and playback units including digital cassette based and digital CD based. We sell equipment from On Hold Plus (onholdplus), Viking, Interalia, Skutch, Premier Technologies, Bogen, Nel-Tech Labs and more! Powers Productions can encode in the format you need for the system or project you need. We produce audio for Panasonic, Vodavi, AT&T, Lucent, Avaya (Spirit, Merlin, Merlin II, Partner, Partner Plus, Dimension, System 75, 85, Horizon & more), TalkSwitch, Toshiba, Samsung, Nitsuko NEC, Comdial, Fujitsu, Harris, Jistel, Mitel, N.E.C., Northern Telecom, Nortel, Rolm, Siemens, Conveyant, GTE, Hitachi, Startel, Stromberg-Carlson, Tadaran and more. Encoding can be a standard wav (wave), MP3, WMF, OGG, µ-law (MU-LAW), VOC, VOX, VAP, Dialogic, ADPCM, PCM, SND, SAM, Real Audio (rm / ram and rp / rpm ).We can master your production to CD, DAT, Cassette, e-mail attachment and more! Basically, you name the system, format and media - we'll take care of you! By the way, if you have the time, be sure to visit our Favorite Links page. To read about Music Licensing concerning your legal commitments with ASCAP, BMI, SESAC and tips from the BBB visit our "The Music Police" page. Thank You! !